A 66cm long polished chrome rectangular wall mount holding four matching chrome arms, each holding a downward facing opal glass shade. This light also features secondary internal clear glass tubes to help protect the light bulbs and a convenient right hand side on / off pull chord switch. Supplied with 3w G9 LED capsule bulbs, this elegant wall light is suitable for bathroom use thanks to its IP44 rating and can also be used in other room in the house to great effect. 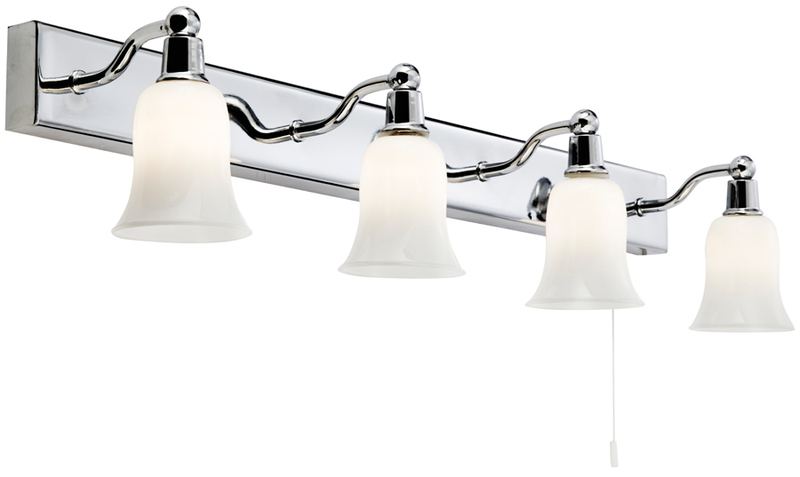 From our range of IP44 rated bathroom lighting. Whether you are looking for an illuminated mirror for your bathroom or separate, individual lights we have a wide selection of lighting for bathrooms to choose from. All our bathroom lighting options have the correct safety ratings required.